Socio- comes from the Latin word socius, which means “companion.” As a sociologist, you’ll study people as companions, the ways in which they live, work, and play together. 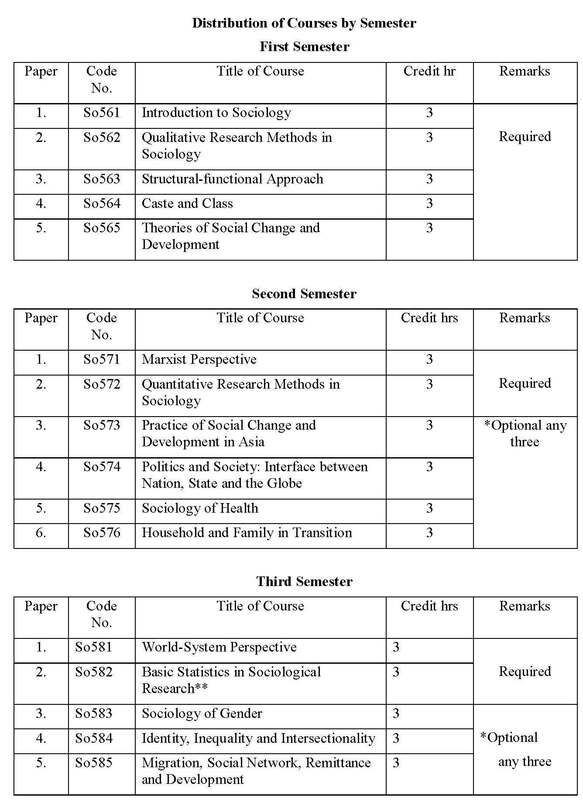 Sociology is a popular field with relatively few positions. So applicants should see competition for most jobs. Sociology has been established as a prominent social science branch under T.U. As member of social science, it encompasses the aspect like human evolution, Human Behavior,social institutions, social structure, social conflict and cultural complex of various societies in the world. In dealing with these aspects, Sociology/Anthropology makes holistic approach and no other members of this domain have contributed in such a manner. The objective of these courses is to impart up-to-date knowledge of the theories and methods of sociology to the students along with training in field-work and secondary data analysis. The second objective is to provide skilled human resource for Nepal development needs. The third objective is to inculcate in the students the spirit of human rights and social justice. Thus the overall objective is to develop professional skill, in both theory and research, in sociology in the students of this discipline at a par with those of other countries. The duration of the course is of two years with four semesters. There is an university examination, in each six months, at the end of each semester. Eighty percent of the attendance in the class is compulsory. The 60 percent external evaluation will be done by the Dean’s office on the basis of final written examination. However, in case of practical courses 60 percent external will also be done practically in computer lab. A student holding a Bachelor degree in any of the following subjects recognized by Tribhuvan University is considered eligible to apply for admission. An applicant seeking admission to M.A. 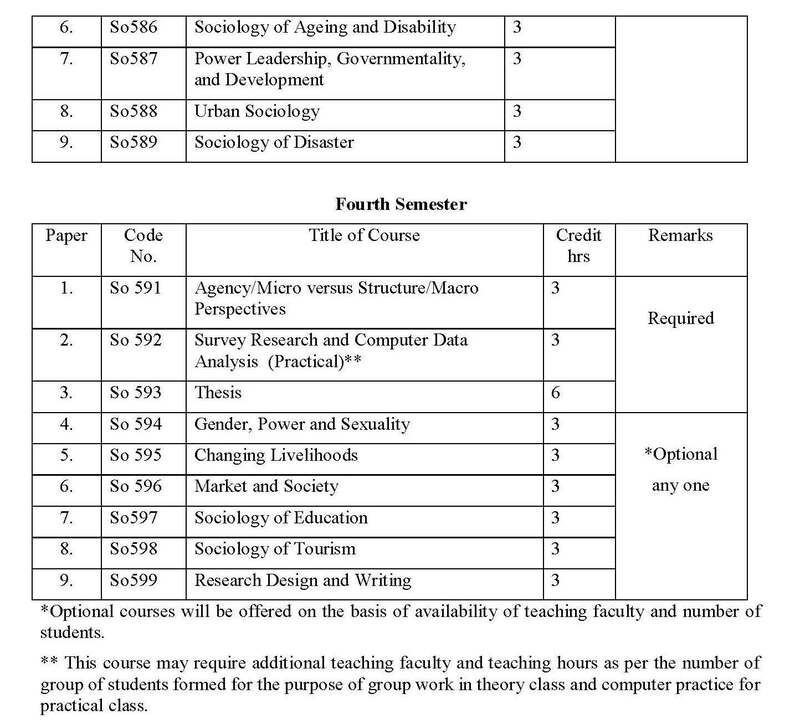 Sociology must appear in an Entrance Examination of one hour’s duration conducted by the Office of the Dean, Faculty of Humanities and Social Sciences, Tribhuvan University. The applicant who fails to appear in the Entrance Examination or to obtain a minimum qualifying score will not be given admission. Admission of the students will be based strictly on the merit list and on the enrollment capacity of the Central Department of Sociology/Campus. Sociologists study people and the behavior within the social groups that they form. They also study social institutions such as religion and law. You’ll also examine the problems, from family arguments at the dinner table to violent crime, that occur within groups. Your research might be used by governments and organizations that help people live and work together better. Many sociologists find work in related fields that require similar skills, such as social services, education, and public policy. For the best opportunities, build skills in statistics and research and learn about applied sociology -- that is, how sociology can be used to solve practical problems.